Wondering what to do with all those tomatoes from the garden? Here's an idea. 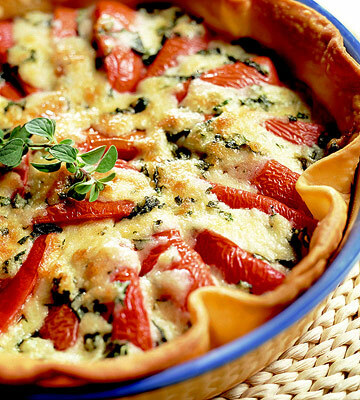 A tomato tart from Midwest Living Magazine. Unfold the piecrust according to package directions. Line a 9-inch tart pan with pastry (it's easier to remove the baked tart if pan has a removable bottom). Press the pastry into the fluted sides of the tart pan and trim the edges. Don't prick. Partially bake in a 450 degree F oven for 5 to 7 minutes or until pastry is slightly dry. Remove from oven. Sprinkle with 1/2 cup of the mozzarella cheese. Cool in pan on a wire rack. Reduce oven temperature to 375 degree F.
Meanwhile, cut the tomatoes into wedges; drain the wedges on paper towels. Arrange the tomato wedges over the melted cheese in a baked crust. In a food processor bowl, combine basil and garlic; cover and process with on-off turns until coarsely chopped. Or snip the basil and mince the garlic. In a medium mixing bowl, combine the basil-garlic mixture, the remaining shredded mozzarella cheese, the mayonnaise, the grated Parmesan cheese, and pepper. Spread the mixture evenly over tomato wedges. Bake in a 375 degree F oven for about 25 minutes or until cheese is golden. Let stand 5 minutes before cutting into wedges. Serve warm. If you like, garnish with additional basil leaves. Makes 8 appetizer or 4 main-dish servings. Labels: . tomatoes, basil, Mayonaise, Midwest Living, mozzerella cheese, Parmesan cheese, pie crust.